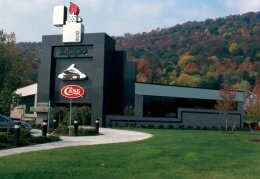 Step inside the Zippo/Case Museum and experience the story of two iconic American products made right here. It is the most visited museum in northern Pennsylvania. See interactive displays, videos and learn about Zippo’s long-time association with Hollywood and rock music. The world famous Zippo Repair Clinic is on display via a huge glass wall in the museum (Zippo has produced more than 500 million windproof lighters, each backed by an unparalleled lifetime guarantee, since its founding in 1932). W.R. Case and Sons, founded in 1889, produces the most collectible knives in the world and the museum exhibits the world’s largest collection of rare Case knives. See the mesmerizing “knife in motion” hologram, the 5′ Kodiak knife and the Case Wall of Fame. ZAC, the Zippo And Case, is a seven-foot high audio-kinetic ball machine — a must see for adults and children alike. Zippo’s diverse products include lighter accessories; butane candle lighters; watches; fragrance; and a robust line of heat and flame products for the outdoor enthusiast. All are showcased at the retail store where you can add a personal touch to your souvenir or gift with on-the-spot engraving. The store has an extensive display of Case sport and pocket knives – and collector’s sets. Zippo’s recently acquired Ronson brand of lighters and fuels are also available.